"Tanoak" redirects here. For the former community in California, see Tanoak, California. Quercus densiflora Hook. & Arn. Notholithocarpus densiflorus, commonly known as the tanoak or tanbark-oak, is an evergreen tree in the family Fagaceae, native to the western United States, in California as far south as the Transverse Ranges, north to southwest Oregon, and east in the Sierra Nevada. It can reach 40 m (130 ft) tall (though 15–25 m (49–82 ft) is more usual) in the California Coast Ranges, and can have a trunk diameter of 60–190 cm (24–75 in). Tanbark-oak was recently moved into a new genus, Notholithocarpus (from Lithocarpus), based on multiple lines of evidence. It is most closely related to the north temperate oaks, Quercus, and not as closely related to the Asian tropical stone oaks, Lithocarpus (where it was previously placed), but instead is an example of convergent morphological evolution. The Notholithocarpus (prev. 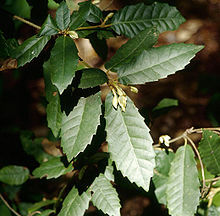 Lithocarpus) densiflorus leaves are alternate, 7–15 cm (2.8–5.9 in), with toothed margins and a hard, leathery texture, and persist for three to four years. At first they are covered in dense orange-brown scurfy hairs on both sides, but those on the upper surface soon wear off; those on the under surface persist longer but eventually wear off too. The seed is an acorn 2–3 cm (0.79–1.18 in) long and 2 cm in diameter, very similar to an oak acorn, but with a very hard, woody nut shell more like a hazel nut. The nut sits in a cup during its 18-month maturation; the outside surface of the cup is rough with short spines. The nuts are produced in clusters of a few together on a single stem. The nut kernel is very bitter, and is inedible for people without extensive leaching, although squirrels eat them. Members of populations in interior California (in the northern Sierra Nevada) and the Klamath Mountains into southwest Oregon are smaller, rarely exceeding 3 m (9.8 ft) in height and often shrubby, with smaller leaves, 4–7 cm (1.6–2.8 in) long; these are separated as "dwarf tanoak", Notholithocarpus densiflorus var. echinoides. The variety intergrades with the type in northwest California and southwest Oregon. Tanoak does grow on serpentine soils as a shrub. Tanoak is sometimes used as lumber,  but isn't currently harvested commercially. ^ Manos, Paul S.; Cannon, Charles H.; Oh, Sang-Hun (2008). "Phylogenetic relationships and taxonomic status of the paleoendemic Fagaceae of Western North America: recognition of a new genus, Notholithocarpus" (PDF). Madroño. 55 (3): 181–190. doi: 10.3120/0024-9637-55.3.181. ^ Chesnut, Victor King (1902). Plants used by the Indians of Mendocino County, California. Government Printing Office. p. 405. Retrieved 24 August 2012. ^ Tappeiner, John C.; McDonald, Philip M.; Roy, Douglass F. (1990). "Lithocarpus densiflorus". In Burns, Russell M.; Honkala, Barbara H. (eds.). Hardwoods. Silvics of North America. Washington, D.C.: United States Forest Service (USFS), United States Department of Agriculture (USDA). 2 – via Southern Research Station (www.srs.fs.fed.us). ^ "Mendocino Coast Furnituremakers". Mendocino Coast Furnituremakers. Retrieved 18 September 2015.